Hello everyone, my name is Garrett. 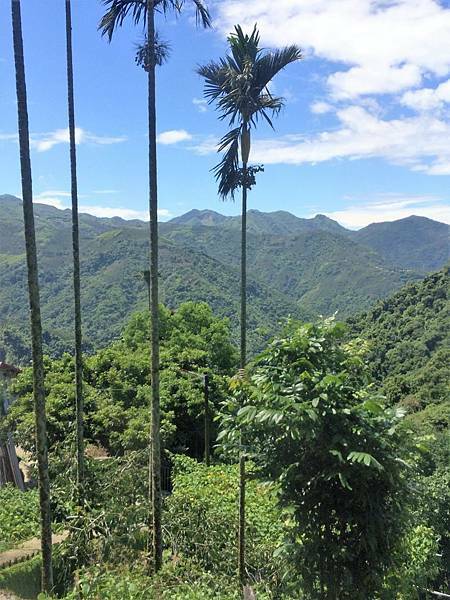 I'm an American college student doing some traveling in Southern Taiwan this summer, and I wanted to share some of my experiences with you. I hope my posts about my experiences can encourage you to come to Taiwan, and help you decide where to go, what to do there, and how to do it (or maybe how not to do it). If you have any questions about traveling in Taiwan or anything else really, there's a comment section at the very bottom of the page, I'd love to hear from you! 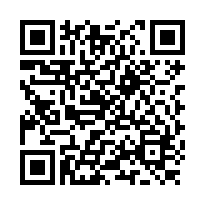 I'll also be writing a Chinese version of all of my posts, which I will also provide a link in each respective one. The information will be relatively the same for both versions, so choose whichever is easier for you to understand. First of all, how do you pronounce "Fenqihu"? What is that scary "q" doing in there? Not to worry, it's easy! 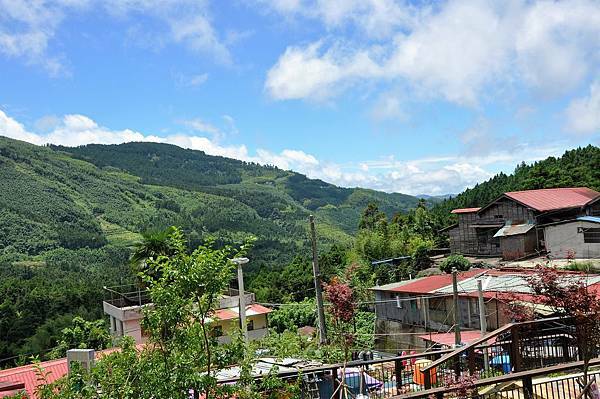 "Qi" is pronounced like "chee" as in "cheetah"
Fenqihu is an old railroad town, located just outside of Chiayi city, and is one of the stops along the way up to Alishan (Mount Ali), another famous tourist spot here in Taiwan. 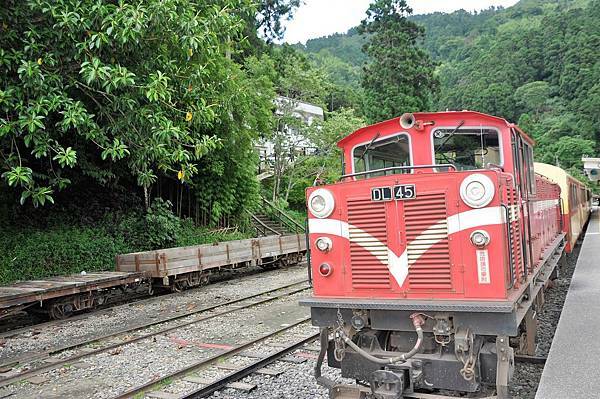 The Alishan Forest Railway was built in 1912, and this small town became a popular resting point for travelers, where they would often enjoy the now-famous Fenqihu lunchbox (便当bian dang, or bento in Japanese). Those of you with any knowledge of Chinese might see the name Fenqihu (奋起湖) and think "So there's a lake there, right?" ("hu" means "lake" in Chinese). Well, call it a misnomer if you will, but there is no lake. It gets the name because apparently, on foggy days, when you look down on the area from above, it resembles a lake. I didn't get the chance to verify that because the weather was perfect when I went! Above: This is the train we took. 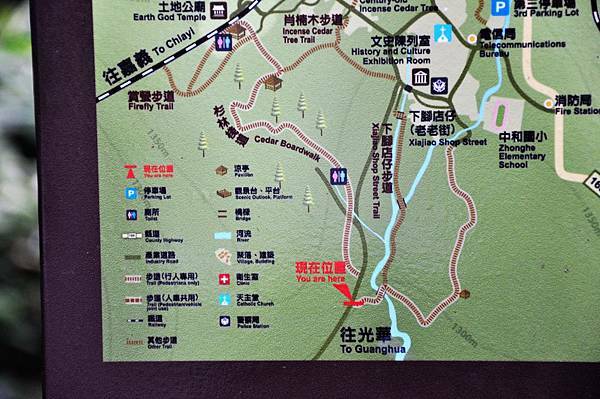 It runs from Chiayi to Fenqihu and back, with several stops in between. 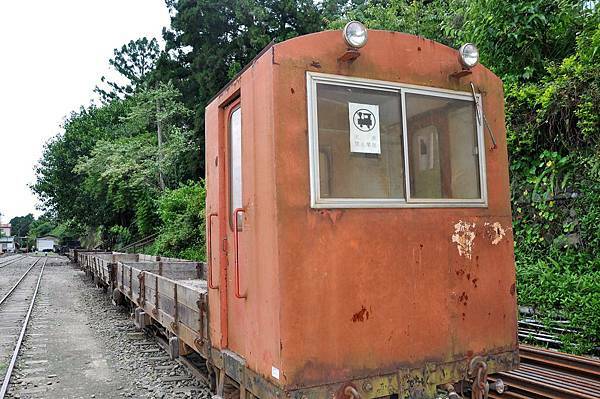 This is one of the older trains, although it was not in the museum, so I'm not sure what it was used for. Given that there are no coverings for passengers, I'm going to assume it was meant for transporting goods, not people. Its design is so simple! The signs say not to climb on the trains, as tempting as it may be. 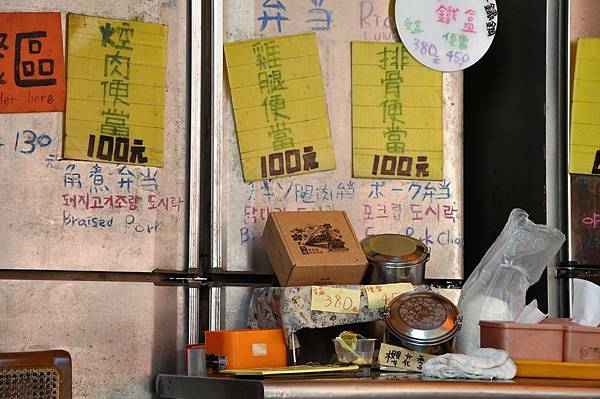 Many tourists come to Fenqihu to visit the "old street", where vendors sell various snacks and trinkets. It bears a striking resemblance to Taipei's Jiufen. I regrettably forgot to take pictures of the street as a whole, but here are some pictures of some of the goods people were selling (I'll hold off on food pictures until later, so you don't get too hungry while reading this). These model trains are like the trains passengers used to take back in the early 1900s (only smaller). 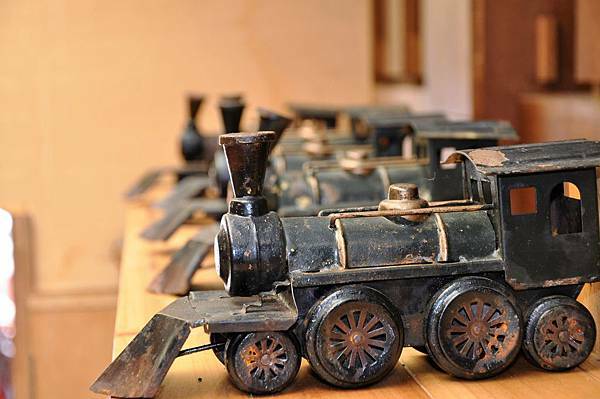 There is a locomotive museum where you can see some of the original trains. The museum is very near to the train station. 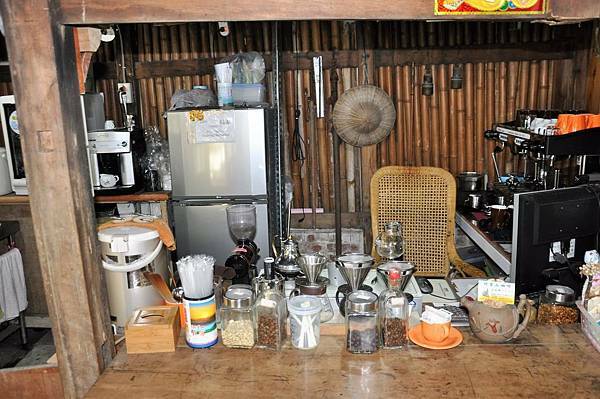 There are many vendors selling locally-grown tea and coffee. 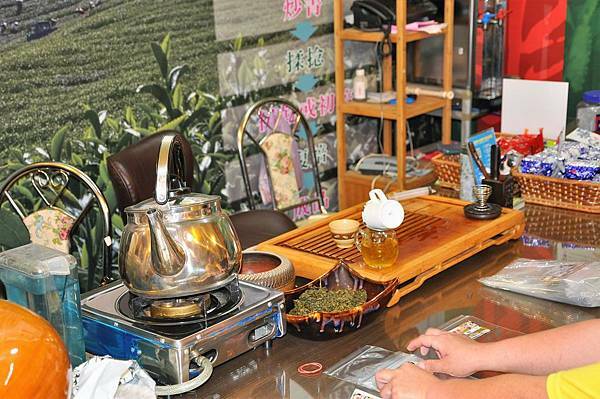 Alishan coffee and tea are quite famous and would make great gifts (but buy some for yourself too, of course). I said I'll wait on food, this is just tea. Relax. It's 200 TWD for one bag of tea. The conversion rate is roughly 30 TWD for 1 USD, so a little less than $7/bag. 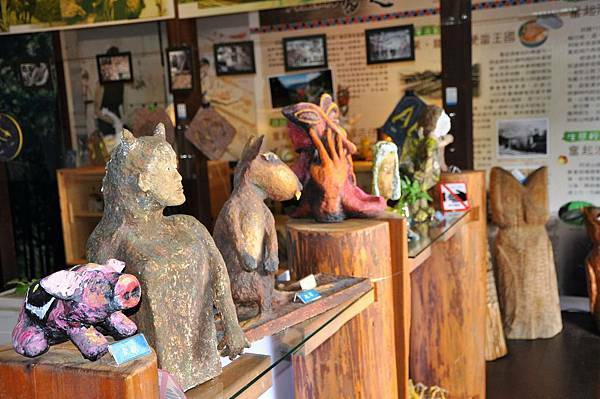 They also had many small toys and trinkets for sale, many of which were made of wood. It reminded me of your typical antique store. 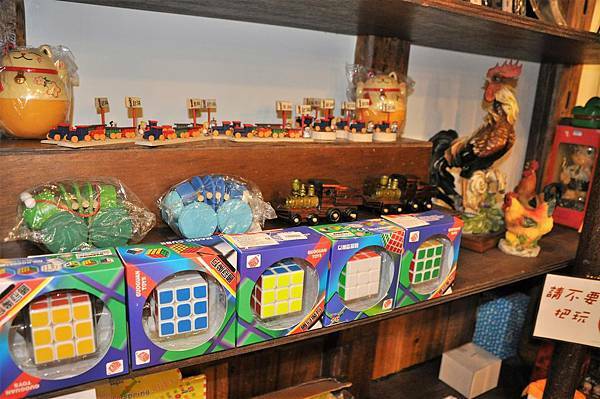 I thought it was interesting that they were also selling Rubik's cubes there (#1 selling single toy of all time, by the way). All of these shops that I went to were off to the right from the train station. However, a lot of the busier and more famous places can be found down the stairs and to the left (exit out the main right door of the train station and then turn left immediately and go down the stairs). 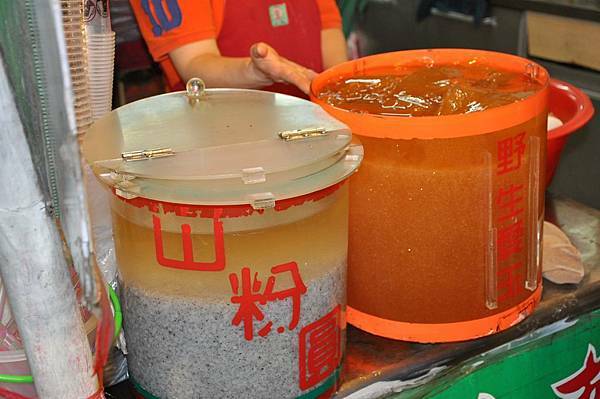 If you see a 7-11, the famous Fenqihu lunchbox place is just off to the left, inside a hotel. You will have to go down another flight of stairs to enter. I finally found the place as I was just about to leave. The "old street" is where most of the tourists gather in Fenqihu, and where most of the shops can be found. But there is an even older street which they creatively call "old old street" (老老街). Granted, I did go there on a Wednesday, so it wasn't as busy as a weekend would be, but there were almost no other tourists on old old street. There were a couple small shops, but hardly any people. This one little shop had nobody manning the station. Perhaps they were resting as is quite common in Taiwan after lunch time. This is the History and Culture Exhibition Room. 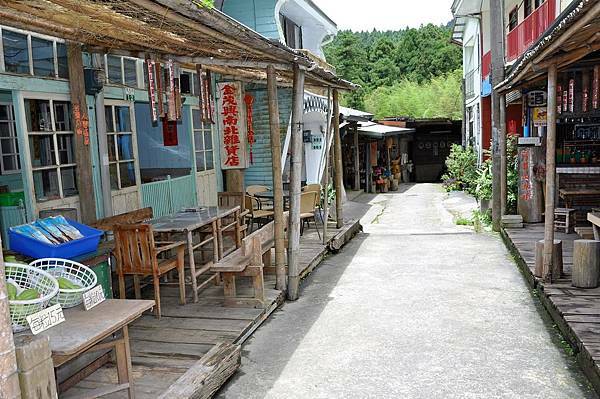 It is a Japanese-style building with a display room in the front, a coffee shop off to the left, and some tables and chairs outside to relax and enjoy some locally grown beverages and the beautiful view. This is located just above old old street. Fenqihu isn't just about old streets and good food, although that is one of the main reasons people come up here. 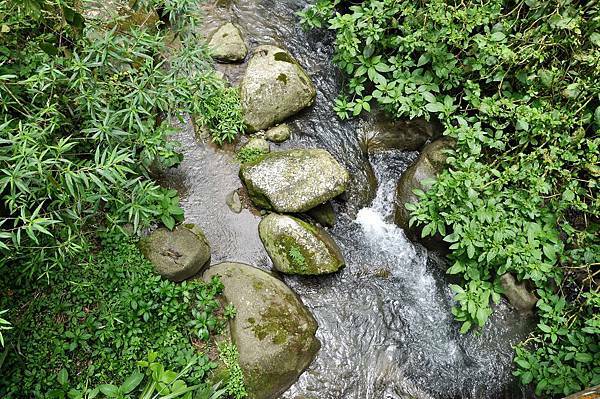 Fenqihu also has a number of gorgeous trails and forests nearby for you hikers and nature lovers out there. I was fortunate that the weather was AMAZING that day. Be sure to check the weather forecast, because you wouldn't want to get caught in the rain here. 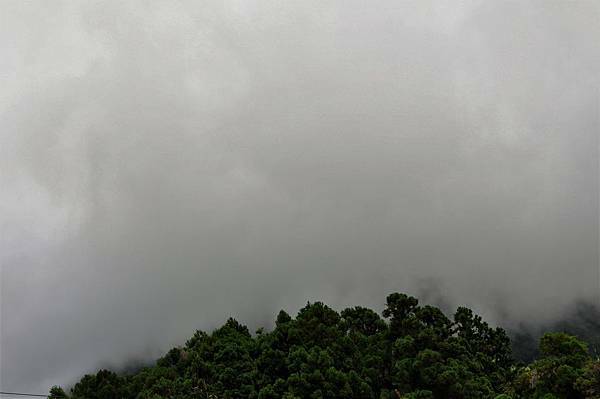 In the summer, it typically rains HARD from about 2 or 3 PM until about 5 or 6PM, depending on the day. The majority of the pictures were taken around 11:30-1:00PM. The view from the balcony behind one of the restaurants on old street. 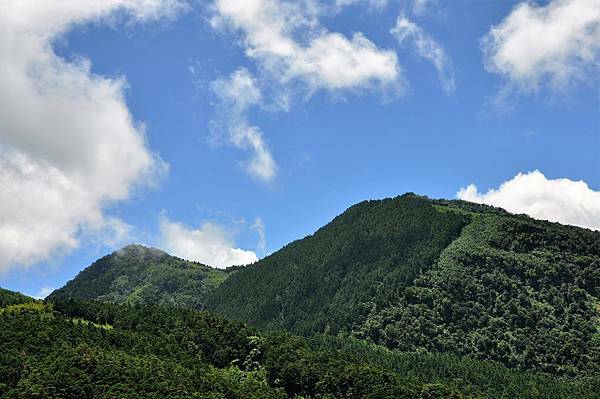 Fun fact: There are over 200 mountains in Taiwan, 165 of which are more than 3,000 meters high. Above: In contrast, this was at 2:00 PM. During the summer, rain in the afternoon is almost a guarantee. 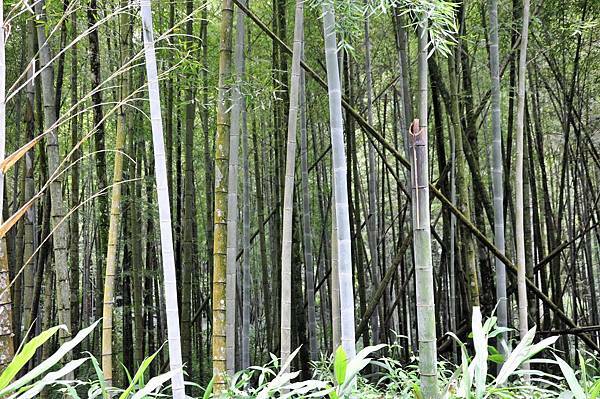 There are a few bamboo forests in the area, almost one in every direction. The one I went to was just beyond (downhill of) old old street. I never knew bamboo could come in so many colors in one area!! By the way, there aren't any pandas here, sorry. 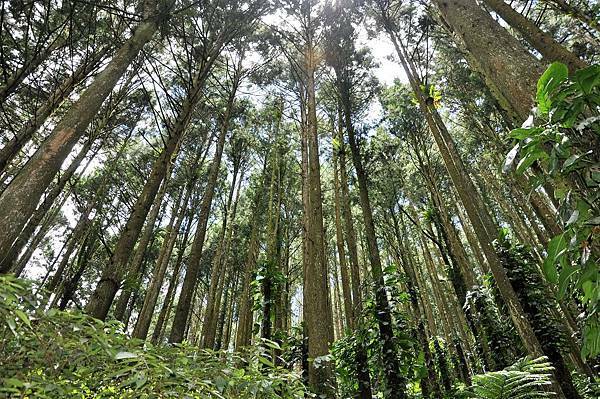 There's actually a place here that has SQUARE bamboo. It's right by the train station to the right, in between the train station and the Earth God Temple (土地公庙). I didn't get a chance to go there because I ran out of time at the end. 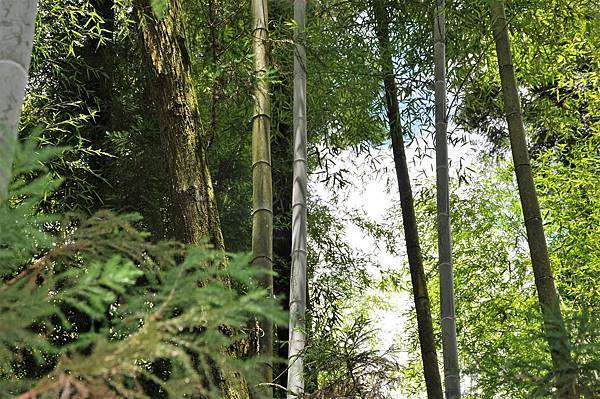 But I talked to somebody and they said it's not really noticeable until you get up close to the bamboo. The route I took was the greenish-colored road running down from old old street. There's a walkway just to the side of it that runs along the stream/river. 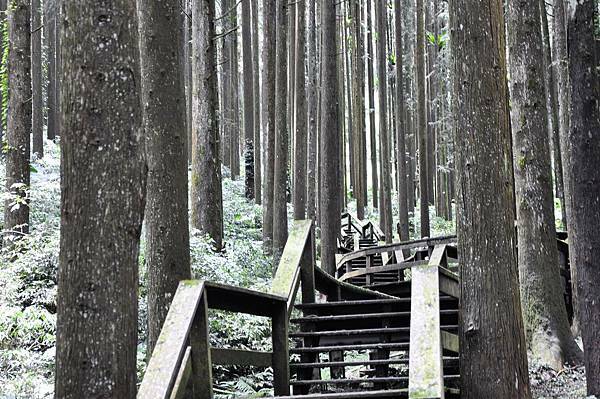 I've heard it's a nice, scenic route, just mind your step if the stairs are wet! I went over and took a peek at the stream before heading back up. This was just across the bridge . This forest was on the trail on the way back up towards the Cedar Boardwalk, from my location on the map above. Warning: the Cedar Boardwalk is not for the faint of heart. I read some reviews before going and people said the trail was pretty difficult. They were not kidding. Be sure to pack light and bring water (you can buy some at 7-11 if you need to before coming down). 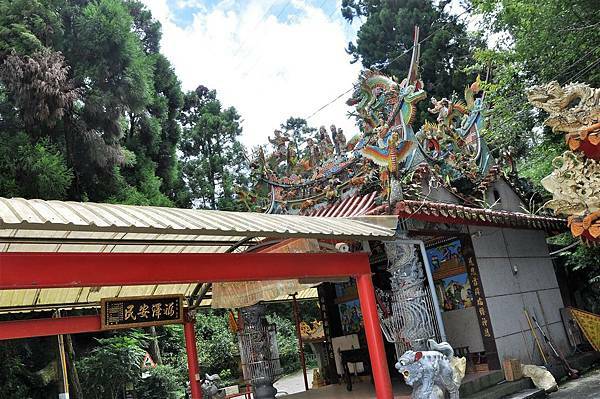 After passing the temple, you should be able to swing by the Square Bamboo forest if you like before heading back to the Railway station or old street for some snacks. I chose to save eating for the very end because I wanted to work up an appetite and I also didn't want to have a food coma. But, it's up to you whether you want to eat before or after, or both. Here's a view of the upper part of the map. Keep in mind that the map flipped because of the direction I was facing on the trail. In this case, up is downhill. 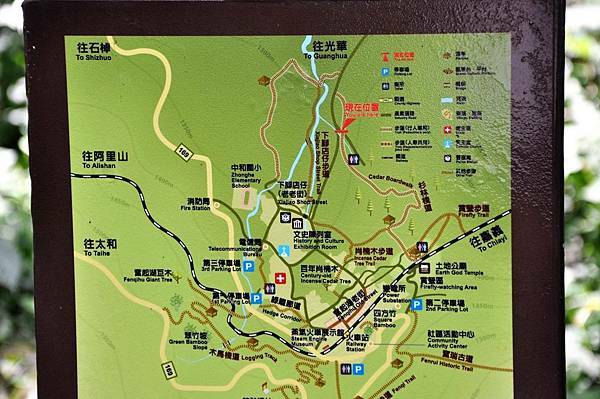 I recommend familiarizing yourself with the map before going, so that you can make the most of your time. Now it's time for some food! After walking up all those stairs, I sure had worked up quite an appetite. This is the lunchbox (bian dang) that I mentioned earlier. While it is not the most famous bian dang place, the ingredients are relatively the same. The famous one, like I said before, is down by the 7-11. The place I ate at was on the upper part of old street off to the right. It was 100 TWD (a little over 3 USD) and I was stuffed afterwards. The bian dang has two choices for meat: pork or a chicken leg (drumstick). I chose the pork. There is also a vegetarian option, but I'm not sure what all that includes. Maybe tofu? 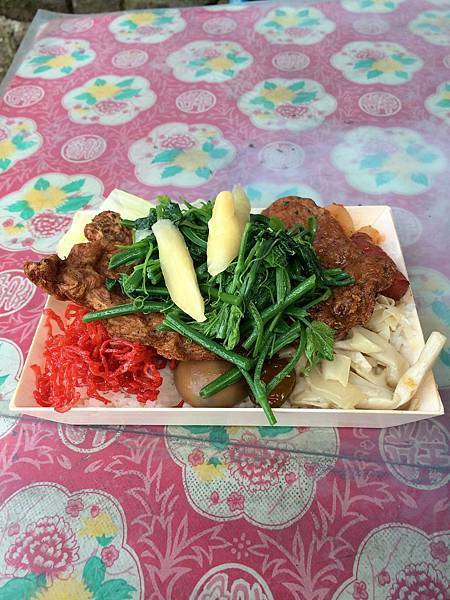 The bian dang is served with rice, some vegetables, and an egg. It seriously tasted so good after walking around for a few hours. 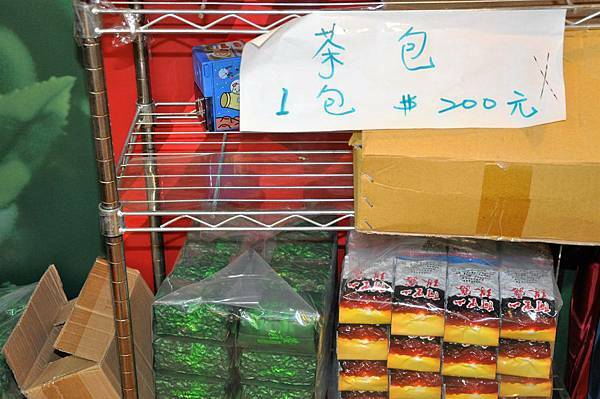 Even though this wasn't the "right place", they still ha some of the lunch boxes for sale. They sell empty lunchboxes for 380 TWD (about 13 USD）and charge 450 for one with a meal inside. So they're giving you a 30 TWD discount if you plan on buying the lunchbox and the meal. Even though I was pretty full after the bian dang, you're never too full for ice cream, right? 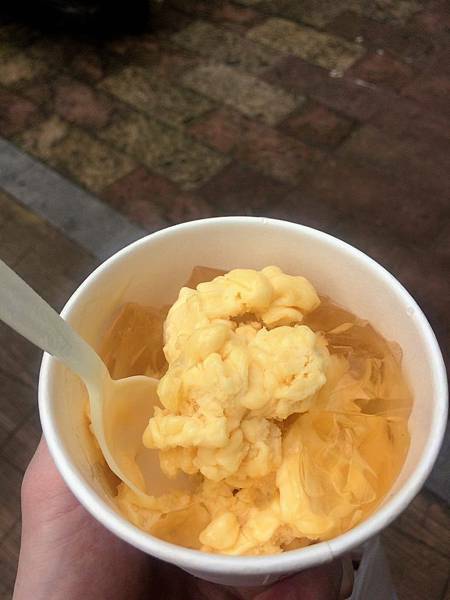 This was mango ice cream with a type of jelly (爱玉 aiyu). They made it by taking two mango popsicles and running them through a machine and then adding the Aiyu on top. It was delicious. Perfect for a hot day. The container on the right is Aiyu and the one on the left is some sort of sweet seed (山粉圆); I have no idea how to translate it. They mix them together with lemonade I believe. Ironically, I had it for the first time the day before at a normal drink stand, so I decided not to order it again. It was good, but I wish they had put in more Aiyu in mine. The last thing that I bought was what I believe the lady said were called train cookies (火车饼). They come in at least four flavors, maybe more. She told me the flavors were Oolong tea, red bean, green bean, and I think green tea. I ordered the assorted pack. 3 of them were good and the fourth one... I didn't like at all. 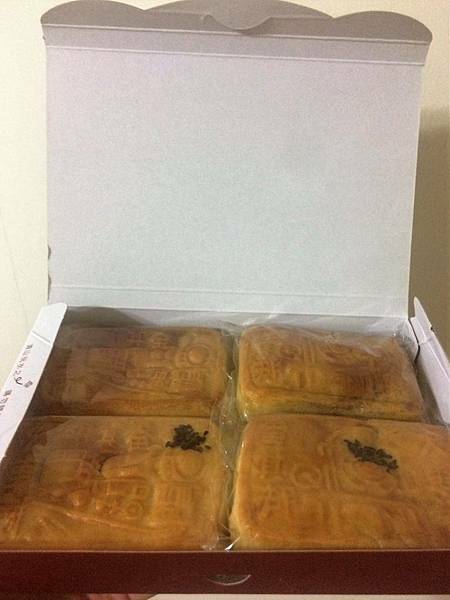 It reminded me of one of the mooncakes I have had before and didn't like. I think it may have been the red bean one, but I'm not sure. The colors inside were brighter than I was expecting for the flavors she mentioned, so I was a little confused. It was 150 TWD for a box of 4 and I think 40 for one. I can't remember the price for individuals. I orginally saw them and thought "Those look really plain and dry" so I didn't buy any. I was WRONG! I met a nice family on the trail and started talking to them. They asked if I had eaten yet, I said "No". Then they offered me a doughnut. It was surprisingly soft and sweet. I think they may have been glazed with honey? 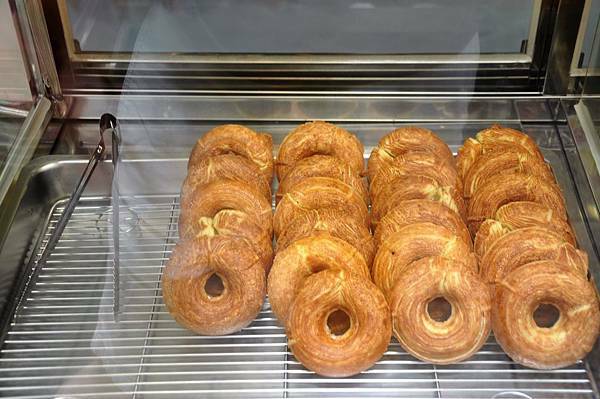 If i went back, I would probably buy a whole box of doughnuts to bring back. They sell for 20 TWD a piece, and they had a sign that said buy 10 get 1 free as well (roughly 7 USD for a dozen). The indoor shops and outside vendors sold many different snacks to buy and samples to try, that I didn't get a chance to eat. Trust me, when you come to Taiwan, you're going to wish you could eat more. I mentioned before that I took the train. It is also possible to take a bus/shuttle or drive up to Fenqihu as well. There are trains that run from Chiayi. I took the train from the Zhuqi station. As the sign says, it took about an hour and a half. 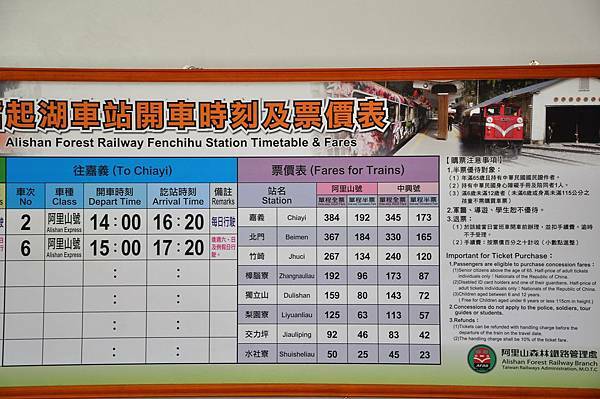 If you're coming from Chiayi station, plan to add 30 minutes or more to that time (and I assume the departure times from Chiayi are closer to 9:00 AM on weekdays and 8:20 on weekends). The Bed and Breakfast that I'm staying at, Village Villa B&B (香林薇拉), is a 3-minute walk from the Zhuqi station, so that made it really convenient to take the train in the morning! In the small, red print off to the side of the times, it says that Train 3 is only on Saturdays and Sundays, whereas Train 1 is every day. 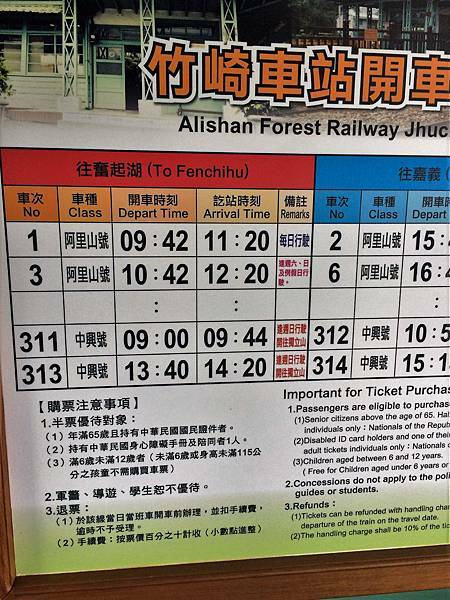 Trains 311 and 313 ONLY go as far as Dulishan (Independence Hill), so you had better wait for the later train. I took this with my phone from the train. There were a lot of palm trees on the way up. There were also a couple waterfalls that I didn't get a good picture of. Overall, gorgeous trip up the mountain. Couldn't have asked for better weather. 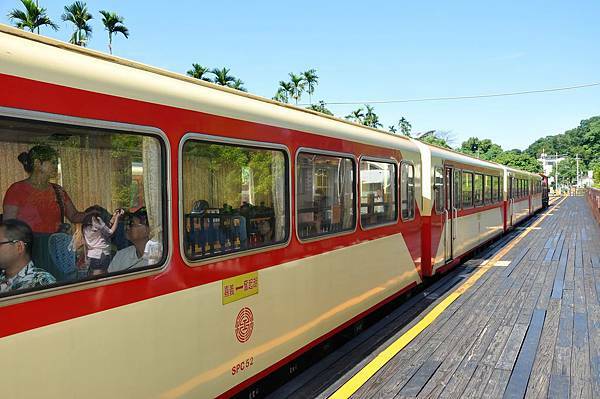 Just as before, Train 2 runs daily and Train 6 only operates on the weekends. The pricing column you're most likely going to want to look at is the leftmost column. To Zhuqi (jhuci), it's 267 for one way. I believe you can buy round trip tickets, but I'm not sure what sort of discount they offer for roundtrip tickets, if any. But you're probably going to be looking at 500 TWD or so for a round trip ticket. You can purchase your tickets directly at the ticket booth up to 4 days before. I bought my tickets the day of on a Wednesday and all the seats were sold out, so I had to stand. That worked out fine, since it allowed me to take pictures more freely. If you plan to go on a busy weekend, you may want to ask the hotel that you plan on staying at to help you reserve tickets in advance, since calling over the phone would require the use of Chinese. Looking at the train times, you will notice that you only have about two and a half hours there if you take the train. Depending on how much you want to do and how far you want to trek down the hill, this could be plenty of time or not enough. If you want to spend more time there, you may want to drive or take the train up and then take a shuttle bus down. But if you go in the summer, the rain will probably restrict you to the same amount of time anyway, so train might be the most convenient method of transportation. I did meet a family who had stayed in a hotel up there, so that is also an option. Thank you for reading! I hope that this post was helpful and that you will continue to read my posts in the future. Again, if you have any comments or questions, I would love to hear from you. Happy travels! Hope to see you in Taiwan soon! 此分類下一篇： Min Hsiung- Ghost houses, Kittens, and Bears! Oh my! 下一篇： Min Hsiung- Ghost houses, Kittens, and Bears! Oh my!